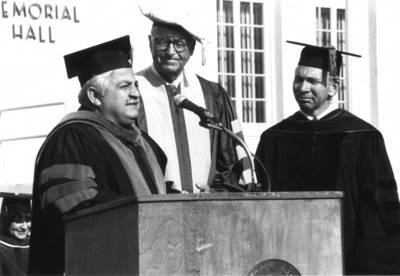 "Commencement, Memorial Hall, Chapman College, 1983"
Kakis, Frederick; Roosevelt, James; Smith, G. T. "Buck"
Commencement, Memorial Hall, Chapman College, Orange, May 29, 1983. Dr. Frederick Kakis, professor of chemistry; Trustee James Roosevelt and President G. T. "Buck" Smith. BW photographs; 5" x 7"